Part 12 of a series recounting the findings of South African jurist Richard Goldstone's UN Fact Finding Mission on the Gaza Conflict. In the late morning of 7 January 2009, Israeli tanks moved onto a small piece of agricultural land in front of the of the house of Khalid Abd Rabbo and his wife Kawthar, on the ground floor of a four-story building in the eastern part of Izbat Abd Rabbo, a neighborhood east of Jabaliya inhabited primarily by members of their extended family. In testimony to Richard Goldstone's UN inquiry, Khalid recounted: "On January 7 at 12:50pm the Israeli army bulldozed our garden and the Israeli tanks were positioned in front of our house. They started yelling at us through the speakers and asked us to leave the house." Moments earlier, at 12:30pm, megaphone messages telling all residents to leave were heard across the neighborhood. According to one witness’s recollection, a radio message was also broadcast by Israeli forces around 12:30pm announcing that there would be a temporary cessation of shooting between 1 and 4pm that day, during which time residents of the area were asked to walk to central Jabaliya. "Of course this happened when Israel had declared [a] ceasefire for four hours, January 7 from 1:00-4:00pm, and that was a truce back then and that’s when wounded civilians could be rescued, and in spite of all of that, in spite of all of this declaration, the Israeli army was there right in front of our house not attempting to move," Khalid said. and his mother Hajja Souad stepped out of the house, all of them carrying white flags. Less than 10 meters from the door was a tank, turned toward their house. Two soldiers were sitting on top of it having a snack. It was 12:50pm. "So we stood by our entrance and holding flags, white flags. The tanks were seven meters away from our house," Khalid said. The family stood still, waiting for orders from the soldiers, but none was given. "[W]e were by the entrance holding white flags and waiting for them to tell us what we should do, whether to go back inside the house or move to somewhere else. They did not say anything to us. There were two soldiers sitting on top of the tank. One of them was eating chips. The other one was eating chocolate. We were looking at them like what are we supposed to do, where should we go, but no reaction from them whatsoever." Without warning, a third soldier emerged from inside the tank and started shooting at the three girls and then also at their grandmother, Khalid maintains. Several bullets hit Souad in the chest, Amal in the stomach and Samar in the back. Hajja Souad was hit in the lower back and in the left arm. "They [started] shooting at the children with no reason, with no explanation, no pretext," Khalid said. "My daughter, three years old, [her] stomach was hit and her intestines were coming out. So really I was amazed at how could a soldier be firing at my daughter? So I carried my daughter, three years old. She could hardly breathe. Like I said, her stomach was wounded. "My other daughter was also wounded in her chest. So I took both of them, Samar and Amal, inside the house. My wife and my mother and my other daughter Suad were still outside. All of a sudden my wife joined me carrying Suad. She was wounded also. Her chest was wounded by many bullets. My mother, 60 years old, she was carrying the white flag and she was wounded on her forearm and also in her stomach." Khalid's account differs from the one produced at the time by Ma'an, which reported that three of the Abd Rabbo sisters were killed by "Israeli warplanes" rather than individual soldiers. It quotes medics confirming ambiguously that the girls were killed "by Israeli fire." Khalid and Kawthar carried their three daughters and mother back inside the house. There, they and the family members who had stayed inside tried to call for help by mobile phone. They also shouted for help and a neighbor, Sameeh Al-Sheikh, an ambulance driver who had his ambulance parked next to his house. Sameeh put on his ambulance uniform and asked his son to put on a fluorescent jacket. They got in the ambulance, had driven a few meters from their house, when Israeli soldiers ordered them to halt and get out of the vehicle. Sameeh protested, saying he had heard cries for help from the family and intended to bring the wounded to hospital. The soldiers ordered him and his son to undress and then redress. They then ordered them to abandon the ambulance and to walk toward Jabaliya. "So we were all inside the house and we started calling the ICRC [International Committee of the Red Cross], the ambulances, anybody to come and rescue us but nobody came and all of a sudden we heard an ambulance but all of a sudden nothing, silence. But later, we saw that the Israeli soldiers asked the ambulance drivers to come out of the car, to undress, and they bulldozed the ambulance with the tank." Khalid's family decided to stay inside the house, all gathered on the ground floor, as they had done safely during previous Israeli incursions into the neighborhood. According to Khalid: "Our house, or our area rather, was subjected to many incursions and each and every time the army would invade the area, would come into our houses, but no harm was done to civilians or to children. Last time, that is before the last war on Gaza, that was on January 3, 2008, the Israeli army came in our house and stayed three days and destroyed many things inside the house but left without harming the civilians or the children. Now during the last [incursion] that is on January 7, 2009, actually the ground war had already started and we heard that Israel had declared war on Hamas. "We are civilians. We have nothing to do with Hamas and we were used to have the Israeli army come into our area," Khalid recalled. "So I thought this time we could stay in our houses. We had nothing to do with Hamas. We did not pose any danger to Hamas. The war, the ground war, started on Gaza and as of the first half hour approximately on January 4, the Israeli army controlled the whole area. There was no resistance in the area. It’s an area nearby the Israeli border. Of course we were inside the houses. We were surprised because the war went on for four days while we were still inside our houses." On 7 January 2009, however, when Amal and Souad died of their wounds, the family decided that they had to make an attempt to walk to Jabaliya. They would take Samar, the dead bodies of Amal and Souad, and their grandmother to hospital. "My mother, 60 years old, was also dying. I was helpless. I didn’t know what to do for my children. There was my daughter dying in front of me. So I carried her and left the house even if I had to die myself because I couldn’t take it anymore. So I carried my daughter and left the house again so that the soldier, he might as just well kill my daughter and kill myself because I couldn’t take it anymore. I couldn’t let my children die in front of me." Khalid explained: "From 12:50 until 2:50 we were stuck inside the house. Once again, like I said, I went out to the soldier. They were there, three of them, and there was a Merkava tank positioned in front of the house. I was carrying Samar, even if I had to die, and I was surprised because the third soldier looked at me and two minutes later he went inside the tank and then he came out and he moved his hand just, you know, telling me you can go ahead. So I immediately went back home inside the house and told them we’re going to die anyway. So we don’t want to die inside the house. Let’s die outside the house. Let’s move. "Although inside the house there [were] more than 25 children, my brothers, my sisters, my dad, my mom. So we had to bring children’s mattress to put my mom on top of the mattress because she was very tired. I carried my daughter Suad, three years old. She was dead… While we were moving, every ten meters they were shooting, once above our heads and the other time by our feet. " Khaled and Kawthar, as well as other family members and neighbors, carried the girls on their shoulders. Hajja Souad was carried by family and neighbors on a bed. Samar was transferred to Ash-Shifa Hospital and then, through Egypt, to Belgium, where she was still is in hospital at the time of writing. "So we were trying to move and every now and then we would fall down. We walked for almost a kilometer and a half until we reached the edge of Jabaliya downtown. Of course, we reached the Kamal Idwan Hospital and they confirmed that the three of them were martyred…surprisingly enough they told me that Samar, no, she had survived and she was moved to Ash-Shiffa Hospital. I took the bodies of my two daughters in order to bury them. We didn’t have any time. This was an outrageous war and the Israeli army was moving around. So we had to bury them, Amal and Suad, and wait until they would bring Samar because we thought and we knew that Samar was going to die. " 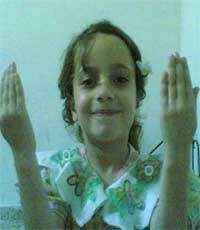 According to her parents, Samar suffered a spinal injury and will remain paraplegic for the rest of her life. "Samar, of course, and with God’s will, Samar survived, survived so that she would be the witness before the world for the atrocities," Khalid said. "Samar survived, paralyzed. She can move only her arms. She can speak but the rest is paralyzed. She can speak for herself and she can tell her tragedy." According to Khalid, "I haven’t seen [Samar] since the events. My tragedy is still going on. It’s not over. So what crime did I commit? I have always been a peace-loving person. I’m for peace. I’ve always supported peace and despite [all that] happened to me I’m asking the world please, please help us live in peace. The Israeli army knows that, that I’ve never been a terrorist. "... why did it happen to me, why did they come to my house, kill my children without having committed any crime. What did I do? "There was no war. It was cold-blooded murder of children. That was not just accidental. No, the soldier even chuckled, like I said. I know that Israel has a very sophisticated technology and that every operation it carries out is actually filmed and I’m asking Israel please broadcast the film of the killing of my children. Did you see my children carrying any rockets?" When Khalid returned to his home on 18 January 2009, his house, as most houses in that part of Izbat Abd Rabbo, had been demolished. He drew the UN fact-finding mission's attention to an anti-tank mine under the rubble of a neighbor's house. He added: "I call upon the international community and ask the international community why my children were cold-bloodedly killed? Why were they fired on? My mother, 60, she was hit in her chest; my daughter Suad, eight years, in her chest; Samar, four years, in the chest; Amal, three years, in the chest, and this is despite the fact that they are all different sizes, all the targeting was at the chest. "This was execution. This was utter execution and I’m asking the world what crime did my children commit? What danger did they pose for the Israeli army? I myself was there. Why didn’t they fire at me? Why didn’t they kill me and not let me see my children die in front of my eyes. My children, until now, I cannot get myself to realize there I was looking at them while they were dying." Goldstone's team found Khalid and Kawthar Abd Rabbo to be credible and reliable witnesses. "It has no reason to doubt the veracity of the main elements of their testimony." The mission also reviewed several sworn statements they and other eyewitnesses gave to NGOs about the incident and found them to be consistent with the account it received, according to the report. Goldstone's report notes that, in general, Izbat Abd Rabbo and the nearby areas of Jabal Al-Kashef and Jabal Al-Rayes saw some of the most intense combat during the military operations. The testimony of Khalid and Kawthar Abd Rabbo, however, shows that Israeli forces were not engaged in combat or fearing an attack at the time of the incident, the report states. Two soldiers were sitting on the tank in front of the family house and having a snack. "They clearly did not perceive any danger from the house, its occupants or the surroundings. "Moreover, when the family, consisting of a man, a young and an elderly woman, and three small girls, some of them waving white flags, stepped out of the house, they stood still for several minutes waiting for instructions from the soldiers." "The Israeli soldiers could, therefore, not reasonably have perceived any threat from the group. Indeed, the fact that the gunfire was directed at the three girls and, subsequently, at the elderly woman, and not at the young adult couple, can be seen as further corroborating the finding that there was no reasonable ground for the soldier shooting to assume that any of the members of the group were directly participating in the hostilities," Goldstone's report states, finding "that the soldier deliberately directed lethal fire at Souad, Samar and Amal Abd Rabbo and at their grandmother, Hajja Souad Abd Rabbo." Goldstone's report further states, that by preventing Sameeh Al-Sheikh from taking the wounded to the nearest hospital in his ambulance, Israeli forces deliberately aggravated the consequences of the shooting. "The Mission recalls that the soldiers had forced Sameeh Al-Sheikh and his son to get out of the ambulance, undress and then redress. They therefore knew that they did not constitute a threat. Instead of allowing them to take the gravely wounded Samar Abd Rabbo to hospital, the soldiers forced Sameeh al-Sheikh and his son to abandon the ambulance and to walk towards Jabaliya. The team found in the above incidents that "Israeli forces repeatedly opened fire on civilians who were not taking part in the hostilities and who posed no threat to them." From that finding, the report extrapolated that the "incidents indicate that the instructions given to the Israeli armed forces moving into Gaza provided for a low threshold for the use of lethal fire against the civilian population." Goldstone found strong corroboration of this trend in the testimonies of Israeli soldiers collected by the Israeli NGO Breaking the Silence, and in the Protocol of the Rabin Academy’s "Fighters’ Talk." These testimonies suggest in particular that the instructions given to the soldiers conveyed two "policies." Both are an expression of the aim to eliminate as far as possible any risk to the lives of Israeli soldiers. The report notes that some soldiers stated that they agreed with the instructions to “shoot in case of doubt.” One of them explained his profound discomfort with the policy and of how he and his comrades had attempted to question their commander after a clearly harmless man was shot. While they disagreed about the legitimacy and morality of the policy, they had little doubt about the terms of the instructions: each soldier and commander on the ground had to exercise judgment, but the policy was to shoot in case of doubt. Investigators also read testimony from soldiers who recounted cases in which, although a civilian had come within a distance from them which would have required opening fire under the rules imparted to them, they decided not to shoot because they did not consider the civilian a threat to them. In reviewing the above incidents the mission found in every case that the Israeli armed forces carried out direct intentional strikes against civilians. In none of the cases reviewed were there any grounds which could have reasonably induced the Israeli armed forces to assume that the civilians attacked were in fact taking a direct part in the hostilities. The team therefore finds that Israeli forces violated the prohibition under customary international law and reflected in article 51 (2) of Additional Protocol, that the civilian population as such will not be the object of attacks. This finding applies to the attacks on Amal, Souad, Samar, and Hajja Souad Abd Rabbo. Not only are civilians not to be the object of attacks, they are also “entitled in all circumstances, to respect for their persons … protected especially against all acts of violence or threats thereof” (Fourth Geneva Convention, art. 27). Fundamental guarantees set out in article 75 of Additional Protocol I include the absolute prohibition “at any time and in any place” of “violence to the life, health, or physical or mental well-being of persons”. According to the facts presented to the mission, these provisions have been violated. "The State of Israel would be responsible under international law for these internationally wrongful actions carried out by its agents," the report states. "From the facts ascertained, the Mission finds that the conduct of the Israeli armed forces in these cases would constitute grave breaches of the Fourth Geneva Convention in respect of willful killings and willfully causing great suffering to protected persons456 and as such give rise to individual criminal responsibility. "The Mission also finds that the direct targeting and arbitrary killing of Palestinian civilians is a violation by the Israeli armed forces of the right to life as provided in article 6 of the International Covenant on Civil and Political Rights. "It applies whenever circumstances permit. However, "each party to the conflict must use its best efforts to provide protection and care for the wounded, the report states, including permitting humanitarian organizations to provide for their protection and care. "The facts ascertained by the Mission establish that in the incidents investigated the Israeli armed forces did not use their best efforts to provide humanitarian organizations access to the wounded. On the contrary, the facts indicate that, while the circumstances permitted giving access, the Israeli armed forces arbitrarily withheld it," according to Goldstone's final report. Part 11 - Did Israel whitewash a massacre in Jabaliya? Part 11 of a series recounting the findings of South African jurist Richard Goldstone's UN Fact Finding Mission on the Gaza Conflict. On the afternoon of 6 January 2009, at least four mortar bombs fired by Israeli forces exploded near the Al-Fakhura junction in the Jabaliya refugee camp in northern Gaza, killing as many as 43 people. Witnesses described the scene of chaos and carnage caused by the bombs. UNRWA's director of operations in Gaza, John Ging, stated: "There is nowhere safe in Gaza. Everyone here is terrorized and traumatized." One shell landed directly in the courtyard outside the Ad-Deeb family's house, where most of its immediate relatives were gathered. Nine members of the family were killed instantly, 11 in total, including four women and four girls. Apart from the shell that landed in the Ad-Deebs' courtyard, three others hit the street outside an UNRWA elementary school, which was being used as a shelter for displaced civilians, damaging part of it. Those three shells killed at least 24 people. Witnesses estimate that up to another 40 were injured by the blasts. The UNRWA shelter's director confirmed that no shell had directly hit the United Nations premises either inside or outside. No one inside the school died. One boy of 16, who was sheltering in the elementary school but was in the street at the time, was killed. About 16 hours prior to the shelling, Israeli forces had already carried out at least one strike, destroying the house of Muhammed Fouad Abu Askar, a Hamas member who denies any involvement in armed militant activities. At around 1:45am on 6 January 2009, he received a personal telephone call from Israeli forces advising him that he should evacuate. "I was informed with a telephone call to evacuate my house 'cause it would be targeted," he told Richard Goldstone's UN fact-finding mission. "I do not [think it was] because I work with the [Gaza] government or even with Hamas, because my activity with Hamas is a peaceful, not military activity." In any case, he responded quickly, evacuating not only his own extended family but also advising neighbors of the imminent strike. "People were asleep, so I called on everybody and said, 'Come out of the house.' I did not want my neighbors to die in their bed. I asked my father, my children to go and knock on the doors and get people out, and I told the neighbors that they have to leave. We went out to the western wall of the Fakhoura School," he said, "and we waited in the street, awaiting the strike." According to the Goldstone report, Israeli forces "did not seek to kill Mr. Abu Askar or the members of his family with this strike." Thanks to the army's telephone call, Abu Askar was able to save himself and his family, the report said. His house was struck by a missile from an F-16, according to Abu Askar, several minutes after the call was received. "This house that we had suffered for years to pay for, this house became just rubble. It was totally destroyed." The building housed not only his immediate family but a large number of his extended family, about 40 in all, who suddenly needed a new place to stay. The same day that his house was targeted, UNRWA opened the elementary school on Al-Fakhura Street to provide shelter to civilians fleeing the areas where Israeli forces had entered. According to the director of the shelter, about 90 percent of those inside had come from outside Jabaliya camp, largely from the Al-Atatra area. He explained that the shelter was guarded by security staff at its entry points and that all people coming in were registered by name and searched to ensure no weapons were being taken into the premises. "This school became a safe haven for many of those who fled other parts [of Gaza] influenced by the war," Abu Askar explained. "It is in the middle of the Jabaliya camp, this school, [in a] very densely-populated neighborhood. Many believed it to be a safe place for two reasons: firstly because it is in the middle of the camp and the center of the camp, and secondly because it has the UNRWA flag." UNRWA has stated that Israeli forces were fully aware that the school was being used as a shelter from 5 January on. UNRWA materials indicate that there were 1,368 people in the shelter at the time of the shelling, which came about 4pm on 6 January. The street outside the school was busy. It had become busier than usual due to the large influx of people looking for shelter, such as Abu Askar. Some were coming to the school to visit relatives who had recently arrived and new people were arriving to seek shelter. According to Hussein Al-Deeb, who lived nearby: "The neighborhood was safe and very far from the presence of the occupation army. It is also a neighborhood that had a school of UNRWA. And everybody who fled their homes went to that school, to the UNRWA school. There were thousands of people who fled and took refuge in that school. It was expected to be the safest area. In the neighborhood there are no military buildings or facilities of any factions or of any military faction." Abu Askar noted that due to the destruction in nearby towns and villages, the square outside the school was full of hundreds of people seeking shelter, "since in some neighborhoods there is not even one house still standing, [or] that can be inhabited. Therefore these people fled to the school." According to Abu Askar, "it was believed to be a place far from being targeted by the enemy. However, and very unfortunately, this was not a safe place at all. It became a battleground, in fact." He was in the street when several mortars landed near the school. He believes that there were about 150 people there at the time. "At 4pm, when the street was crowded with people, the shells started falling barbarically," he explained. "[While] we were awaiting the keys, the shells started to fall. We could distinguish nothing but the sound, the smoke, and people taking refuge on the floor." Abu Askar said "the first strike was on the western corner of the school," but he and others were on the eastern corner, "so there was only a wall separating us from the place of impact. We took refuge in a house in that area and we were watching what was happening with our own eyes, the missiles hitting and the people falling on the floor, on the ground. ..."
"I went to the parallel street, next to my house. There were at least eight corpses on the ground. I went to help transport the martyrs. The first martyr to be lifted from the ground, and I carried him with my own hands, was my eldest son, Khaled. Next to him was my brother-in-law, and he carried my second son, Imad. Next to them was also my brother, Arafat. There were bodies everywhere, about 30 martyrs, just from my own neighbors, in addition to passers-by, who just happened to be in that street." Witnesses indicated that all of the explosions were over within around two minutes. As the dust cleared near the school, and "after we cleared bodies and injured by [the use of] the ambulances," Abu Askar learned that his neighbors had also been targeted. "We did not know about the shelling of the Al-Deeb family house because of the confusion. And when we were told about the Al-Deeb house shelling, we went and we found bodies strewn on the ground, and as I said, it was only two minutes during which all the shelling finished." One shell landed directly in the courtyard outside the Ad-Deeb house, where most of the family was gathered. Surviving relatives explained that nine family members were killed immediately. Ziyad Ad-Deeb lost both legs as a result of the blast. Other survivors and neighbors carried the dead and injured one after another to the hospital. Ambulances came, but most casualties were transported in private cars. Alaa, a daughter of Mo'in Al-Deeb, was taken to Egypt, where she died of her injuries. In total, 11 members of the family were killed. Ziyad, in his testimony to the mission, recalled that there were about 16 family members inside his house when it was struck. "We were together, including my father, the women, and the children and my grandma. And everybody was actually in a joyful mood." Audibly, "there was a bombardment near us. So we were trying to solace each other and to support each other. And at that moment we felt, somehow, relative security because of the togetherness of the family. Also we felt security because we were just near the UNRWA school," he said. "We felt more secure being closer to the school. ... Had there been any warning, we would have left the place." "When the fallout rested, I started looking around. I looked at my own self. I found that I lost my legs and my legs were exploded away and I was sprawled over the body of my own brother. I looked for my father and the rest of my relatives. I found them motionless and most of them were killed, except for the crying of two small children and I was waiting for the ambulance to come." According to Hussein Al-Deeb, who survived but was seriously injured: "The second day, when I awoke from anesthesia, that's when I received the major shock. Most of my family members had disappeared in a second. Our family, my mother, the other members of the family, was 21 people. The house was full of women, of children, – it was full of life. And within seconds everything disappears. You lose your mother, your children, your little boys and girls." Speaking publicly in Gaza City to Goldstone's mission, he added: "I don't know if you can put yourselves in my shoes and imagine what you would feel. The most precious people you have in the world you lose within seconds and for no reason. This is why we come here today to speak before you. Why? Why did I lose my family? Why? What's the reason? I don't know what else I can add, but the shock is tremendous. And whenever I even think about it, I relive it." Almost immediately, contradictory accounts emerged from official Israeli statements. The initial position accepted that Israeli forces had struck inside the UNRWA school, claiming to be in response to Hamas fire. A later response accepted that Hamas had not been in the school but had allegedly fired from 80 meters away from the school. Finally, Israel claimed that in fact Hamas operatives were launching mortars at Israeli forces for around one hour, firing every few minutes until they identified them and returned fire, killing a number of them. After an investigation that took place over the past hour it has been found that among the dead at the Jebaliya school were Hamas terror operatives and a mortar battery squad who were firing on IDF forces in the area. Hamas operatives Immad Abu Iskar and Hassan Abu Iskar were among terrorists identified killed." Further statements from spokespersons for the Israeli prime minister, as well as the country's Foreign Ministry and the Israeli military, all adhered to the position set out in the same statement. In two interviews, the prime minister's spokesman, Mark Regev, emphasized that he considered Hamas was mounting a cover-up in relation to the fact that senior operatives had been killed by Israeli forces in its strike and in particular that two persons, Imad and Hassan Abu Askar, were "well-known members of the Hamas military machine – part of the rocket network. On 7 January, one day after the attack, in a television interview on the British Broadcasting Corporation's program Newsnight, Regev indicated that he believed Israeli forces attacked the school because they came under fire, that the school was occupied by Hamas operatives and that those supposed Hamas operatives had committed a war crime by using the premises for the purpose of launching mortars. In another interview, Regev indicated that Israeli forces returned fire after having received mortar fire, that he assumed the school had been taken by force by Hamas "with guns," and that the movement's fighters held the civilians in the school as "hostages." On the same day, Major Avital Leibovich, an Israeli military spokeswoman, in an interview with Channel 4 news, said that Hamas had fired from "the vicinity of the school," but later asserted that the two Hamas militants were actually inside the school firing at Israeli forces. Also on the same day, Captain Benjamin Rutland, another Israeli military spokesman, made a presentation posted on YouTube. He indicated that it had transpired later that the mortar fire had come from within a United Nations school, that this was a crime on the part of Hamas, and that civilians had been killed. He noted, however, that Hamas terror operatives had been killed including the well-known Abu Askar brothers. Muhammed Abu Askar dismissed the allegations as ludicrous, particularly because one of the two supposed brothers, "Hassan Abu Askar," was unknown to anyone in the family or town, and likely never existed. "The spokesman of the army said that two wanted activists of Hamas who launched rockets were targeted. And he gave the names: Imad Abu Askar and Hassan Abu Askar. And he insisted on that for three consecutive days. He was trying to [justify] this large number of casualties," Muhammad alleged. As for his young son Imad, who really was killed, Muhammad said that when contacted by foreign journalists for background on his son, "I showed him a picture of Imad. He was named as the wanted person. And [the journalist] was surprised to find out that Imad is a 13-year-old boy. He's not linked to any faction, he's not linked to any rockets. The other name that was mentioned, Hassan, I asked him to look into the civil registry, the population census in Gaza. In the Abu Askar family there is no Hassan at all." "There is no indication that anyone of the name of Hassan Abu Askar was killed in the attacks," Goldstone's report determined. It neither denies the possibility of children being recruited by Palestinian armed groups. However, in the case of Imad Abu Askar, "the Mission is satisfied that he was not a Hamas operative. Apart from his father's vehement and, in the Mission's view, credible rejection of any such claim, two other factors appear relevant. "Firstly, since it has become clear that Imad was a 13-year-old boy it is noticeable that Israel has not commented further on the allegation of his alleged Hamas activity in general or the allegation in particular that on the day in question he had launched mortars at Israel." Secondly, Israeli forces directly called Abu Askar early in the morning of 6 January notifying him that his house would be attacked imminently. "If Imad Abu Askar was as notorious and important as alleged, despite his young age, the Mission presumes that the Israeli authorities would have known where he lived and, in particular, that he lived in the very house they were about to destroy. "It is extremely doubtful that the Israeli armed forces, having identified the house where alleged Hamas militants of some significance lived, would warn them so that they may escape and then bomb the house." These justifications for attacking the school were contradicted, as well, by UN officials who said the UN school was not attacked. In light of those contradictory statements, Goldstone's report emphasized that, in its view, "Israel’s Government developed a position justifying the striking of an UNRWA school as a result of the immediate outcry generated by initial erroneous reports that the school had been hit. That effort included a number of statements, in particular those by Mr. Regev and Major Leibovich, which turned out to be erroneous." Among those statements were the allegations about the young brothers. According to Goldstone's report, "It would appear that shortly after the attack the Israeli armed forces received some information that two Abu Askar brothers had been killed. That much is indeed true. However, the use made of that information appears to the Mission to have been knowingly distorted. The brothers were Imad and Khaled, not Imad and Hassan as asserted. One was a 13-year-old boy, the other was a recently married 19-year-old. The certainty and specificity with which the Israeli authorities spoke at the time make it very difficult for them to suggest now that they had simply mixed up the names." According to Muhammad, Israeli forces did not mix up the names. He recalled a journalist asking an army spokesman if Imad, 13, could have really been the target, and the spokesman said, "'We are sure that Imad was killed,' and he insisted that he was the one targeted." As for his elder son, "He got married 15 days before the war, and such grooms, as you know, happily spend their days as newlyweds, and they do not really have time to go to war or to be wanted," according to Muhammad, noting that his eldest son was not old anyway. "He's also quite young. He was only 18 years old. Again I say that what was being targeted was a child," Abu Askar added. Nevertheless, an Israeli military spokesperson confirmed on 12 January that the army was adhering to the same positions as had been expressed on 6 and 7 January. The position set out on 6 January was repeated in comments to the press on 12 January by an Israeli military spokesman. On 15 and 19 February 2009, The Jerusalem Post, an English-language Israeli newspaper, published reports quoting Colonel Moshe Levi of Israel's Coordinator of Government Activities in the Territories (COGAT). He indicated in the first report that the stories of 40 or more dying as a result of the attack were the result of distortions and that in fact Israeli forces killed 12 people, including nine Hamas operatives and three non-combatants. The later report of 19 February lists seven of the 12 he said were killed. He also pointed out that Israeli surveillance footage showed only a "few stretchers were brought in to evacuate people." Goldstone rejected this statement outright, noting: "If Israel had that capacity of surveillance in the immediate aftermath of the shelling, it must have been able to see that the shells had hit on the street outside the school and not inside the school. "Furthermore, if such surveillance was recorded, in the face of serious allegations levelled against the Israeli armed forces by several sources after the military operation in Gaza, the Government could have made this footage public in order to establish the truth of its claims regarding this incident." Additionally, highlighted by Abu Askar and others, news footage showed many injured. "The wounded and the martyrs were carried to the hospital, and that was captured by cameramen," he said, citing videos that proved "most of the casualties were children. About 60 percent were children. The cameras did not take any pictures of any military people or combatants, as is alleged by the occupation army." As for The Jerusalem Post's reports, Goldstone notes that COGAT "did not provide any information to explain where the information on the dead came from. None of the seven names corresponds with any the Mission has so far established died in the attack." The position assumed by Colonel Levi is problematic, the report adds, "in the light of the relatively uncomplicated case of the al-Deeb family, of whom nine members died immediately and two died later. Four of these were women and four were children." Given these figures alone, and the relative ease with which the victims could be identified, the report considers the COGAT assertions as to the total numbers and identities of those killed in the mortar strikes to be unreliable. "Even if the Israeli authorities were to be correct in saying that nine combatants were killed, they are, in the considered view of the Mission, incorrect in stating that only three non-combatants were killed." Regarding the UNRWA school in Jabaliya, the Fahoura school, the investigation concluded that the IDF used minimal and proportionate retaliatory fire, using the most precise weapons available to them. Hamas made this necessary, as it fired mortar shells at Israeli forces 80 metres from the school. Additionally, it was concluded that all of the shells fired by IDF forces landed outside of the school grounds. Soon after the source of fire was detected, a scouting unit was dispatched to confirm the location. Approximately 50 minutes after the mortar attack had begun, two independent sources cross-verified the location of the mortars. Only subsequent to this, and after verification of a safety margin of at least 50 metres between the target (i.e. the identified source of the mortar fire) and the UNRWA school, did the force respond to the ongoing barrage, by using the most accurate weapon available to it – 120-mm mortars. [para. 388]. Abu Askar also dismissed the updated explanation. Now, he noted, "after we showed that Imad was only a little boy, the occupation started to say that that area was used to launch rockets. Whoever visits Al-Fakhoura neighborhood has no doubt whatsoever that this place could not be used to launch rockets, and that [is] for several reasons: Firstly, it's a public street, a street where there's a lot of circular traffic. You cannot put a platform there to launch a rocket. It is also an open area that can be seen by the enemy's aircraft. "Also, it is an overcrowded area, and those from Beit Lahiya and Al-Atatra also fled to the school. And therefore there are contradicting stories regarding the targeting of Imad, the little boy, or targeting those launching rockets from that area. These are false stories. These are lies, especially [since] from the casualties we did not find any combatant, any military person, or even any piece of weaponry." Goldstone notes that the altered explanation did not indicate where the "Hamas fire" came from, only stating it was 80 meters away. "The Mission finds it difficult to understand how the Israeli armed forces could have come to this view without having the information at the same time that Hamas operatives had been firing mortars for almost one hour. It regards these new allegations as lacking credibility. "A further assertion made several times by Israeli spokespersons on 6 and 7 January and confirmed again on 12 January was that the strikes had not only managed to hit the militant rocket launchers but had also killed two senior Hamas militants, namely Imad Abu Askar and Hassan Abu Askar. Again, for the most part these early assertions indicated that both had been killed in the UNRWA school. It is noticeable that the Israeli armed forces' summary of their own preliminary investigations does not repeat this claim." In its analysis of Israel's explanations for the fire, the Goldstone report concludes: "What is now clear is that, if any Hamas operatives were killed by the Israeli strike, they were not killed in the school premises. It is difficult for the Mission to understand how the Israeli authorities could establish with such certainty within a matter of hours the identities of two of the Hamas operatives it had killed but could not establish within a week that the alleged firing had not come from the school and that the Israeli armed forces had not hit the school." While Goldstone's report notes that of nine interviews the team conducted, no witness ever stated that he had heard any firing prior to the attack, his mission accepted, to analyze the allegations of disproportionality "for the purposes of this report, that some firing may have occurred that gave rise to the Israeli armed forces' response." The team conceded that it was aware of at least two news reports that indicate local residents had heard such fire in the area. One report comes from The Associated Press, whose sources insisted on anonymity. The other is by Jonathan Miller, a correspondent of the British Channel 4 news program, who reported that locals told him "militants had been firing rockets" at Israeli forces and were running down the street to get away. "The Mission notes that the attack may have been in response to a mortar attack from an armed Palestinian group but considers the credibility of Israel's position damaged by the series of inconsistencies and factual inaccuracies," the report states. "The confusion as to what was hit, the erroneous allegations of who was specifically hit and where the armed groups were firing from, the indication that Israeli surveillance watched the scene but nonetheless could not detect where the strikes occurred, all combine to give the impression of either profound confusion or obfuscation." Despite some of Israel's more over-the-top explanations, the report does not allege that its military's attack on the UNRWA school, which killed dozens of civilians, was intentional, as other incidents were deemed elsewhere. But the report does allege that it was disproportionate to any hypothetical projectile fire in the area, itself never positively established. "The Mission recognizes that for all armies proportionality decisions will present very genuine dilemmas in certain cases. The Mission does not consider this to be such a case."